Now Available on DVD, Blu-ray and Digital Download!!! This is the fourth installment in the My Little Pony Equestria Girls series, and I hope not the last, as the girls and I love seeing these movie, which seem to come out once a year. In previous My Little Pony Equestria Girls films, we saw Twilight Sparkle, Fluttershy, Applejack, Pinkie Pie, Rainbow Dash and Sunset Shimmer in a school setting, a battle of the bands and then last up, Friendship Games. Today marks the release of the 4 movie, which is set at Camp Everfree. Who doesn't love going away to camp, especially with the campfires and making of new friends? But, how would you feel if you arrive at camp and strange things are happening? Well, this is the case when the Equestria Girls arrive at Camp Everfree. And, it is up to them to work together and use their magic to help Twilight Sparkle confront once and for all "Midnight Sparkle" within herself. While most of these movies has Twilight Sparkle front and center, this new release surprising had Sunset Shimmer in a lead role. It was nice as it was like bringing it back to the original My Little Pony Equestria Girls movie where we first met Sunset Shimmer. Both of my girls are huge Sunset Shimmer fans, so they were happy to see her in this new release. I wish you could have seen my girls when we received this new release in the mail the other day. Even though we have been sidelined with croup and pneumonia in our house (not fun), both girls had enough energy to let our squeals of excitement. And, for the past week or so, we have been watching this new release each and every day. You would think the girls would be getting bored with it by now. But, nope, they love to sing and dance along to the catchy songs immersed throughout the film, and continue to root on Twilight Sparkle to confront the dark Midnight Sparkle and help bring peace to Camp Everfree. While I am a fan of the first My Little Pony Equestria Girls movie, my girls are saying that this is their favorite of the four. I can see this, when they ask each morning to watch it again. :-) They love this new release and I know you and your special MLP Equestria Girls fan in your life with, too. So, why not pick up a copy to share now, or add to their stocking this holiday season. I, for one, wouldn't have been able to hold off on giving this to my girls until Christmas, as I was eager to see it and knew they would want to see it as soon as they could, too. :-) It has made for a great way to forget about being sick, and as an excuse to snuggle up on the couch with the girls and get our MLP Equestria Girls fix. "What Could Be More Fun Than A Field Trip To Everypony’s Favorite Camp? When Canterlot High School goes on a field trip to Camp Everfree, they're surprised to find a magical force is causing strange things to happen. Twilight Sparkle , with the help of the Mane 6 and especially Sunset Shimmer (who refuses to give up on her), must confront the dark "Midnight Sparkle" within herself and embrace her newfound magical abilities to save the beloved camp from closing down for good!" For pony fans ordering their copy directly from Shout Kids, a free poster is included. Copies of the film for sale in Walmart will include a pair of Twilight Sparkle barrettes! Copies at all other retailers come with an adorable “Camp Everfree” sew-on camp patch. 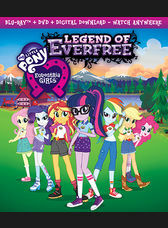 Thanks to the kind folks over at Shout Factory, three (3) lucky Inspired by Savannah readers will have a chance to win a copy of the new “My Little Pony Equestria Girls - Legend Of Everfree” DVD. My daughter and I both love Pinkie Pie! My little friend Courtney would like watching this girly DVD with her friends.